24 7 News Net - 31 Cities in US to be Struck with DISASTERS says Sollog! 31 Cities in US to be Struck with DISASTERS says Sollog! The Net's most famous seer Sollog has just released his newest PROPHECY. It's called 31 Disasters. In it he names 31 cities in the USA which he calls SUSA (Satan USA) which will all be struck in the future with ACTS of God like Earthquakes or Hurricanes. Except for Washington DC that is, that city will be struck with NUKE TERRORISM! Should you be worried that Sollog says SUSA (Satan USA) will be DESTROYED basically by the WRATH OF GOD? In 1999 I wrote a book about Sollog since he was becoming a major figure on the Net. His various sites are some of the busiest on the Net. His name is often in the top of search engines for what people are looking for on the Net. There are close to 100,000 posts about Sollog in Usenet where many MORONS think I'm Sollog, the same morons say anyone that posts positively about Sollog is Sollog! Now these MORONS ignore the fact that I've even done an audio interview with Sollog for this site. I'm not Sollog but you know how MORONS are, you can't explain the TRUTH to them. In writing my first book on Sollog I included several famous Sollog Prophecies that had scored impressive hits. One of these prophecies ended up giving crystal clear details of the 911 attack on NYC and also the anthrax attack on the NYC media. The FBI visited the offices of my publisher DUE TO MY HAVING THE Sollog PROPHECY in my book in 1999 about 911 and the NYC media anthrax attacks! I've written another book about Sollog over that fact, it's called THE 911 WARNING. From 2000 to 2002 Sollog released via his web site http://www.Sollog.com ten earthquake warnings for major and rare 7.0+ quakes. These warnings were all posted all over Usenet by some of his fans so they were TIMESTAMPED by Google.com before the events they foretold occurred! Sollog hit the first five dead on as to the exact date when a rare 7.0+ quake occurred. For anyone to even hit ONE DATE with a guess for a rare 7.0+ quake is almost 30 to 1 probable! Sollog did it FIVE TIMES IN A ROW! Several of those first five quake warnings even had THE EXACT HOUR of the future quake in his warning! That's about a 600 to 1 probability. The last five date and location quake warnings of Sollog gave an exact location where a rare 7.0+ range then struck within 31 days after he issued his warning! So when Sollog says an ACT OF GOD is coming your way, YOU BETTER TAKE NOTICE! Sollog is also known for hitting his hurricane warnings as well. In fact Lili recently struck Louisiana SEVEN YEARS TO THE EXACT DATE when Sollog warned a US Federal Magistrate Louisiana would be struck by such a major hurricane. I know he did this, since his Statement to the judge in October 1995 was in my 1999 book about his prophecies. The reason was he also warned the court that a world leader would die in early November of 1995. Rabin died on the date he gave! So the FACT IS Sollog's older prophecies that have had many hits KEEP ON HITTING new events in the future! Sollog's newest prophecy is sure to be a prophecy for the ages. In it Sollog not only names 17 Cities in the USA (SUSA) to be struck with hurricanes, HE NAMES THE 17 HURRICANES that will do the deeds! How many of these cities have to be leveled by hurricanes he actually names before Sollog becomes the greatest seer in history? Sollog also names 13 cities in the USA that will be struck by great earthquakes. The maps below show each city Sollog named and how these cities all connect to each other through what Sollog calls LINES OF TRAGEDY. 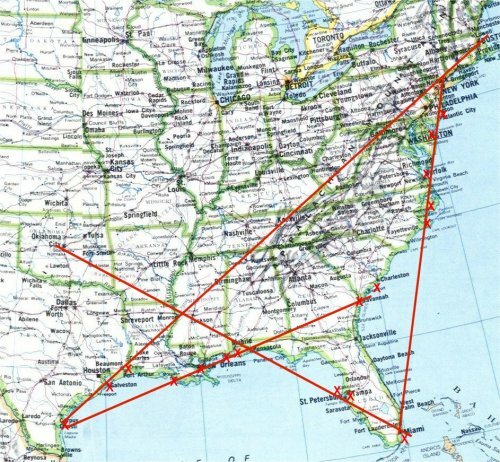 All 17 Hurricane cities lie on four such hurricane lines. The 13 earthquake doomed cities all lie on 4 lines of earthquake tragedies as well. It is interesting to note only one of the earthquake lines is near a known fault line, which is the San Andreas. However, it does not run exactly as scientists say the San Andreas fault line runs. Scientists usually say the San Andreas runs from San Francisco through San Diego. Sollog has his earthquake line running from SEATTLE to SAN DIEGO, which puts both Portland and Los Angeles on the Sollog earthquake line and not on the San Andreas. Sollog actually has San Francisco on a line that runs through Las Vegas, Phoenix and San Antonio! The rare and unexplainable mid-west great quakes are all connected to a New York City to Tucson quake line. This line includes not only New York City, put Philadelphia and St. Louis! Salt Lake City and Lincoln Nebraska are on another Sollog quake line that connects Reno to Washington DC. Below are maps showing the Sollog Quake and Cane lines! 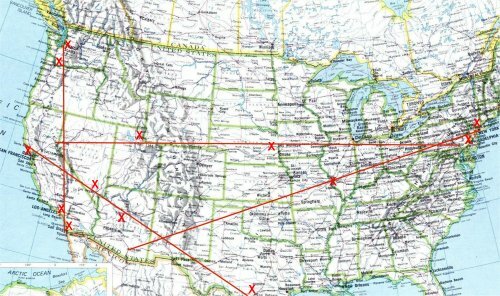 I've also put an X at the locations that Sollog says THE WRATH OF LORD GOD ALMIGHTY will soon be striking SUSA! Sollog explains why GOD is basically going to destroy the USA in his Prophecy. He lists THE SEVEN SINS OF SUSA.